The Foam Shop is no stranger to providing church pew cushions or kneeler interiors; throughout our years in service we have supplied many churches up and down the country. We have the specialist reconstituted foams in stock for these projects, because they are manufactured and designed for daily use over many years without losing their shape or density. We wouldn’t recommend using a lesser quality foam for these types of projects as they just would not do justice to your covers especially if you have put time and effort in to making them as a DIY project. If you are looking to make a large order we recommend contacting us directly for this type of foam. Please have your sizes and quantities available and we can offer special discounts when large quantities are required. 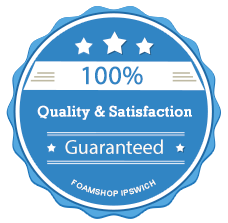 With today's internet market and the constant strives to be competitive on price, you can rest assured that here at the foam shop, we do not compromise on quality just to be competitive. We do not sell joined, damaged or discolored products, and all of our supplies are of the highest specification and we do not make any purchases of B grade products. The Foam Shop; where quality and customer satisfaction comes first.